There are many, many covers of this classic. Some people will complain it’s a schmaltzy adult bore, or that it’s too camp. 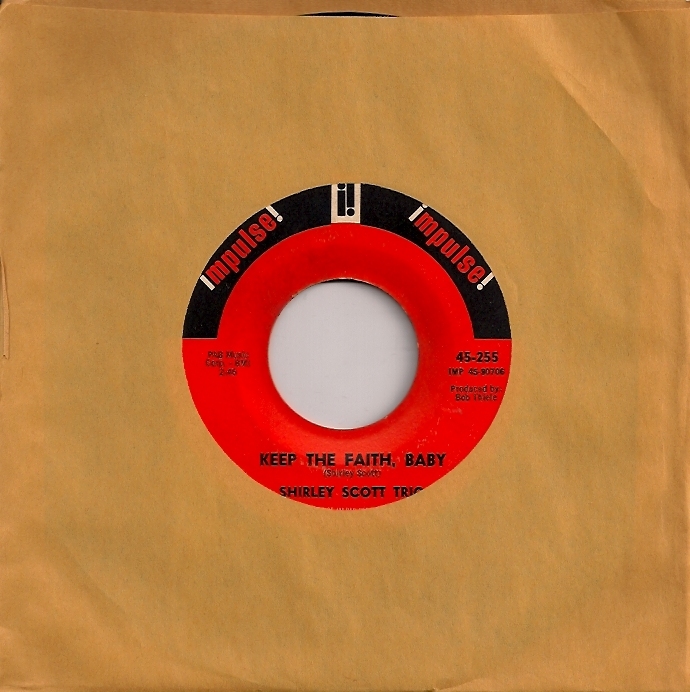 But be informed, the greats have done it in varying styles: Aretha Franklin, Donald Byrd, Johnny Mathis, Sarah Vaughan, Richard Groove Holmes, Donny Hathaway, Julie London, Stan Getz even Timebox. I like them all. Interestingly, it can withstand many very different interpretations. The Vibrations, like The Contours, were in that poor man’s Temptations or Four Tops category. Consequently, both often tipped into Northern Soul. Their version of ‘Misty’ though brings me right back to the Syracuse War Memorial October 30, 1965. 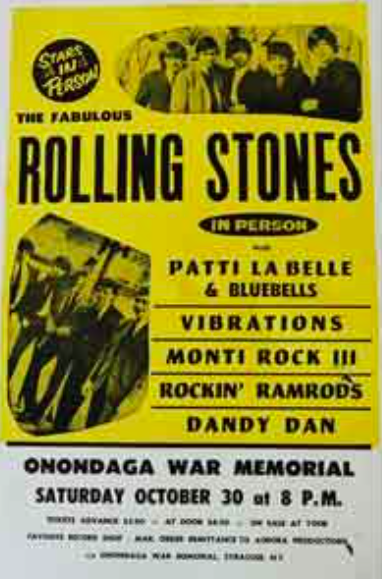 The Vibrations, along with Pattie La Belle & The Blue Belles, were opening for The Rolling Stones. Bravely, they performed this clad in shiny purple chino suits; and the power of the vocal had ten thousand restless kids in silent awe. Check out the final high notes here, you’ll see what I mean. During the mid 90′s, I spent a ton of time in Seattle. We nearly bought a place there in fact. They were almost giving away 60′s houses back then. In one way, it might have been a great move. 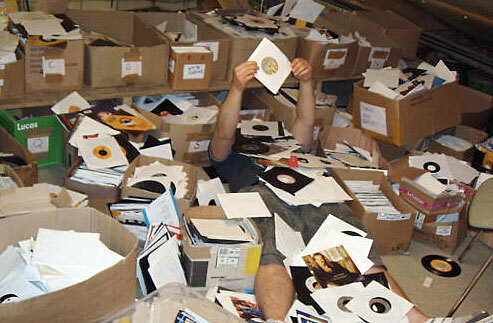 I could have bought even more records, and just left them in the new place. Because let me tell you, they were nearly giving away records then too. Golden Oldies was the local chain that sold only used vinyl. There were like five stores in the greater Seattle area. And the main one, on NE 45th Street, was my shrine. I spent hours in the place. Everything was beautifully organized, basically by genre. 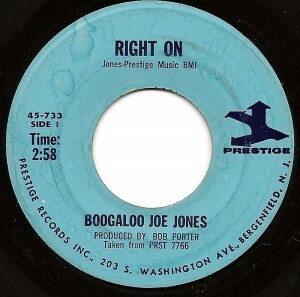 The jazz singles took the least time to scour. Not because of quantity. No, there were a ton. But they were all 50¢, tops. I bulked out a massive jazz singles library by default. Grabbed everything remotely interesting. Never left a Verve, Prestige, Atlantic or Blue Note single behind. And the jukebox worn copies, loved those too. Combine that with a seemingly bitchy drug and alcohol abusing dame, doing lounge covers from the 50′s or 60′s, and I’m grabbing a copy. Not that Carmen McRae was necessarily any of those, but I can fantasize and did. 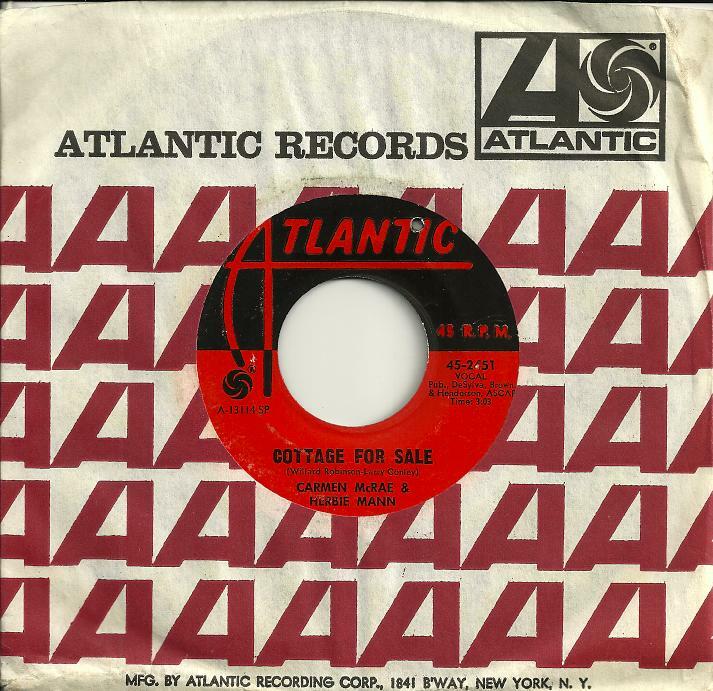 ‘Cottage For Sale’, on Atlantic, black vinyl turning white from years in the jukebox of an old man’s bar for 50¢. 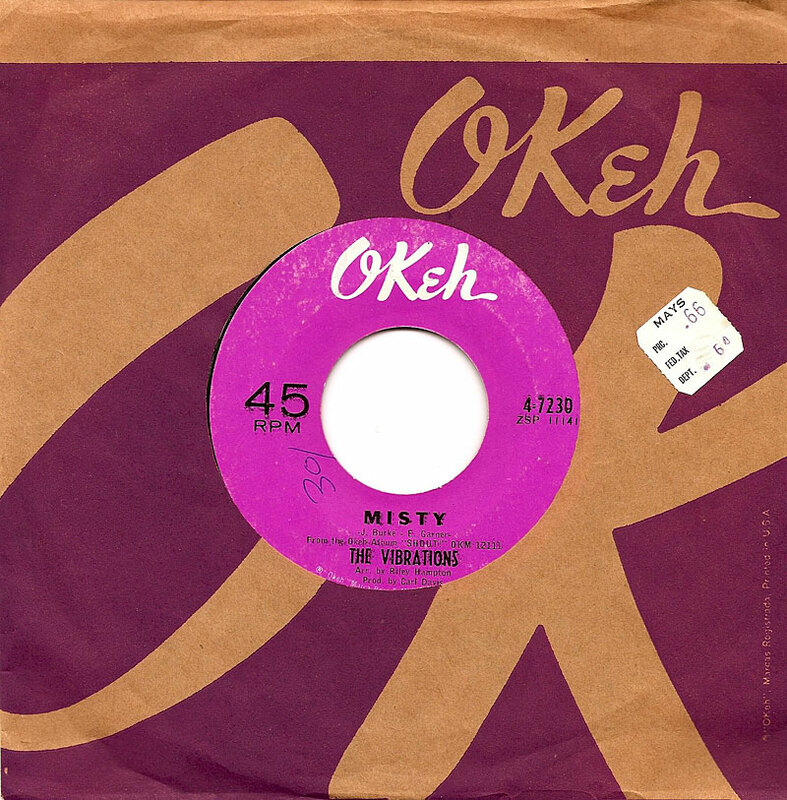 There are many, many covers of Erroll Garner’s ‘Misty’ from ’54. Some people will complain it’s schmaltzy, a bore or that it’s too adult. 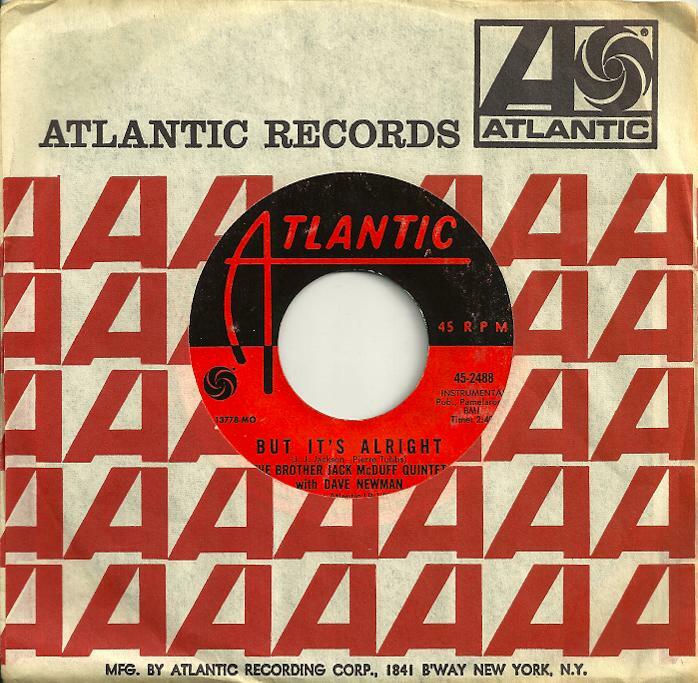 But be informed, the greats have done it in varying styles: Aretha Franklin, Donald Byrd, Johnny Mathis, Sarah Vaughan, The Vibrations, Donny Hathaway, Julie London, Stan Getz even Timebox. Almost forty years later, in ’91, ‘Misty’ was inducted into the Grammy Hall Of Fame, not surprising given one of the most common jokes about the RIAA’s recognition process is how out of touch they can be. 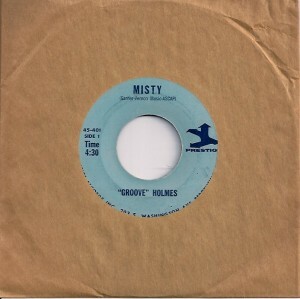 It’s a fact: like Bobby Hebb’s ‘Sunny’, ‘Misty’ weathers just about every genre well. 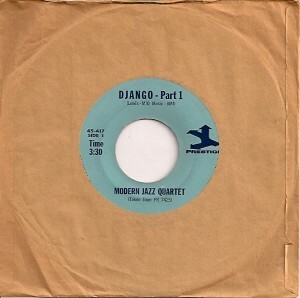 The Modern Jazz Quartet’s run with Atlantic Records was a superior one, every new album as superb as the last. Their vibes/piano/bass/drums template perfectly proceeded to calm my nerves. When it comes to jazz, gentle and sparse wins over harsh and busy any day of the week. In the early 90′s, many a company trip to Seattle became my norm. Corinne and I loved it there, and near moved into one of the endless 50′s ranch houses seemingly round every corner. The junking was superb and the vinyl shops were as close as you can come to dying and going to heaven in the US. It’s where my fetish for jazz 7″s began. 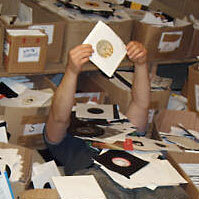 There was a chain of used vinyl only stores, all sectioned within by genre. 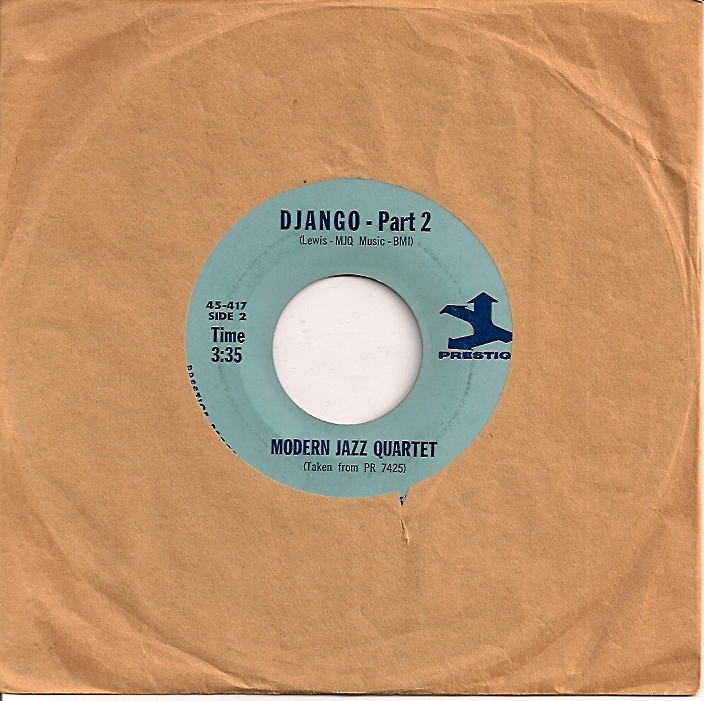 Nobody seemed even slightly interested in the jazz singles. Albums yes, singles no. If virtually no competition wasn’t enough, the $1 price tag was the straw. Basically anything on Verve, Blue Note, Prestige and Atlantic were no brainers. In only a few visits, my jazz collection went from zilch to very complete. Plus they fed the jukebox perfectly. 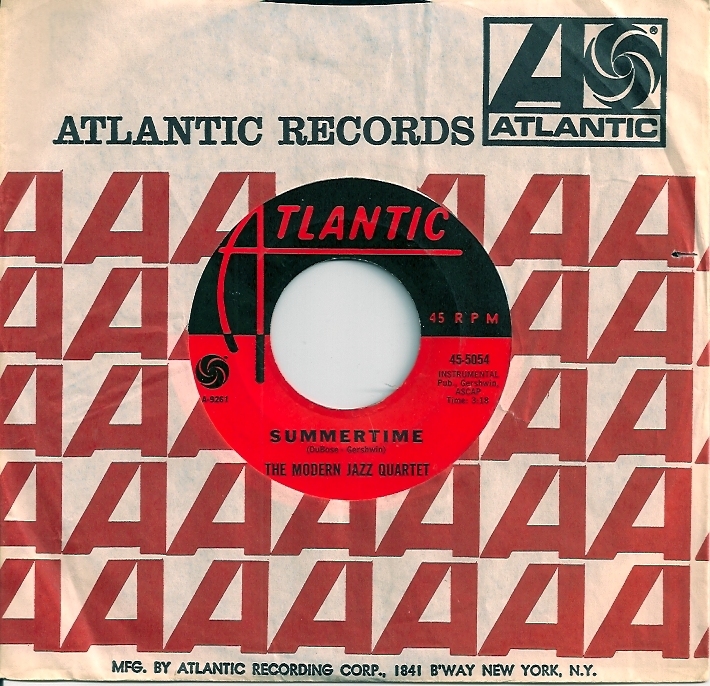 ‘Summertime’ looked radiant sitting there in The Modern Jazz Quartet’s bin. Shiny Atlantic label (on plastic as opposed to vinyl) + original stock sleeve + unplayed pressing + can’t-lose song delivered via their signature approach + $1 price tag = jackpot. 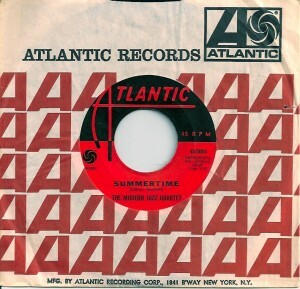 When I finally got home, ‘Summertime’ went directly onto the Seeburg. 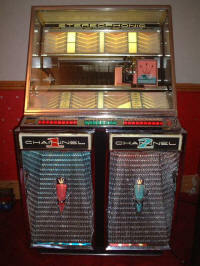 It still resides there today, having weathered, I would guess, hundreds of spins hence it’s lovingly played condition. Their version turned out to be better than I could ever have expected. 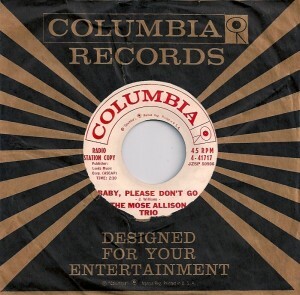 Not for years after I should have paid attention, did I finally discover Mose Allison. He played local clubs when I was in college, but I foolishly missed him. Somewhere along the line, I’d noticed Georgie Fame dropping his name one too many times, so had a look. Probably picked up a dollar album or the like. Don’t remember noticing his singles much. Their voices were almost identical, and the way Georgie Fame revered him was obvious. This would have been the early 90′s, when I started to collecting jazz singles. They were everywhere, and dirt cheap. All of them sounded particularly good in the jukebox. I used to brag about hating jazz, and how it should be a controlled substance but now admit my arrogance was out of line. Still don’t like the brassy side, but small combo piano/guitar/vibes stuff, love those. The Mose Allison Trio fit right in, definitely paved my way to a whole new genre of 7″ collecting. ‘Dijango’ would make a nice segue from the previous post’s ‘Moments in Love’, I’m positive they would blend together flawlessly. One of the many virtues of my Seeburg 222 is how calming yet live jazz singles sound when playing. Possibly it’s the old tube amps, or those cone speakers – whatever the case may be, this isn’t the first time I’ve pulled a copy out of the wall rack to share here on the site as a result of it coming up when I just push about thirty random selection numbers – then let the box play for an hour or so. I guess it was the 50′s version of a ‘shuffle’ feature. I love The Modern Jazz Quartet. They are exactly they way I appreciate jazz lineups the most. I call it small combo. In their case drums, bass, guitar and piano/xylophone. An immaculate conception. They have many fine singles, and albums as well. Good for anytime of the day or night, regardless of season. It pays to hit church sales even when it’s raining. I learned my junking skills years ago, and have really calmed down the obsession in the last few. But I decided to hit a rummage this AM. It was gloomy when I woke up, just like in the fall when most of the good rummage/church/Jewish center sales are, so almost nostalgically, I got up and went. 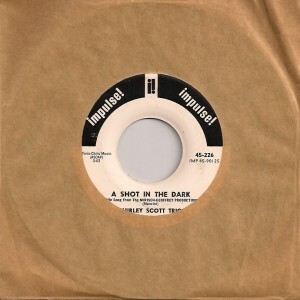 If I’d known last night what a nice pile of jazz 7″ers were awaiting me, I wouldn’t have slept at all. 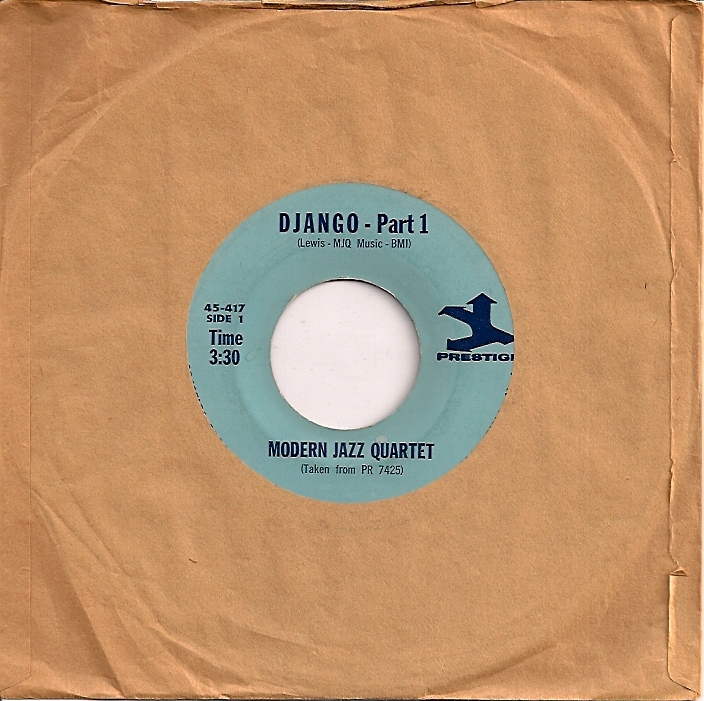 Etta Jones, Jimmy Smith, Wes Montgomery, Jimmy McGriff, Brother Jack McDuff….I know, it’s cruel to continue. And the sweet checkout lady, who remembered me dragging my daughter Lucy last year, asked about her, quite happy I was buying a cake from their bake sale to bring home – so she gave me the singles (about 20) and a citrus orange (with a 70′s ‘Love American Style’ flower pattern in lemon & butterscotch) crock pot for $2.00 total. I’m knee deep in them, all cleaned and bagged. I always loved this one. It might be a bit PC of me to choose, but it sounds so warm in mono on vinyl. 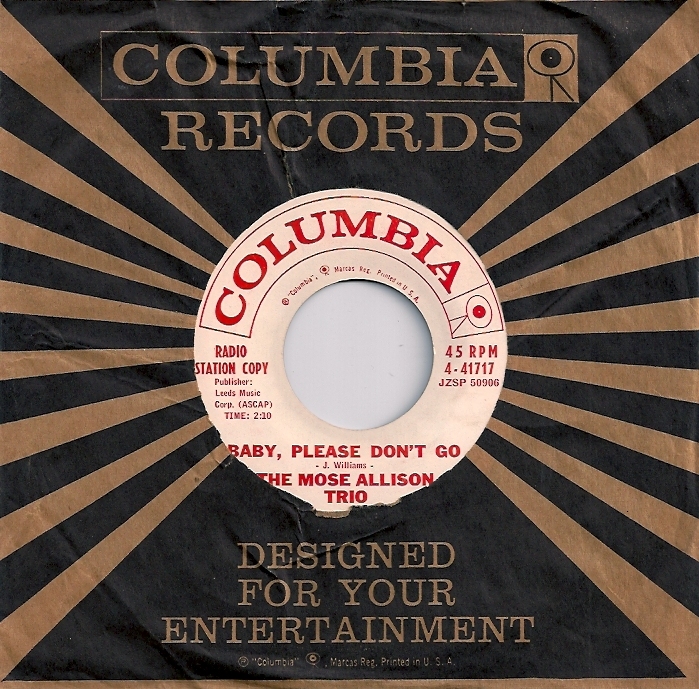 I tried it in the jukebox – WOW! Scary. They were made for each other – I’d swear it was mastered through Seeburg speakers if I didn’t know better. Now I do have a few of BJJ’s albums, seems he only recorded for about 12 years (’66-’78) and word is he’s a preacher in Pennsylvania. 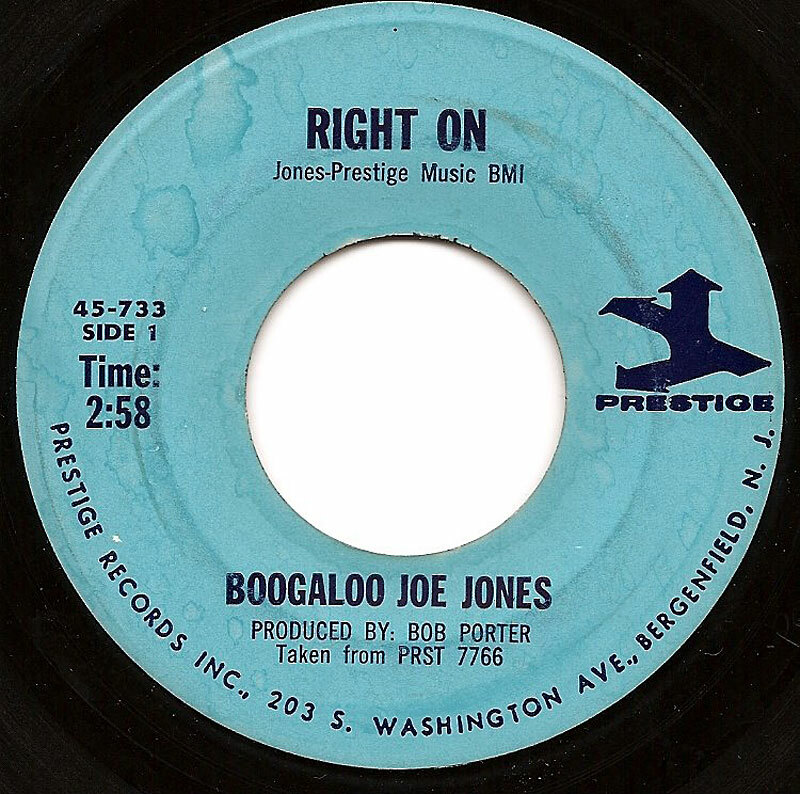 He also is listed as Ivan ‘Boogaloo Joe’ Jones, depending on where you look. His BLACK WHIP album from 73 for Fantasy has some good things (‘Freak Off’ and ‘Black Whip’), but also some dodgy covers of McCartney’s ‘My Love’ and Elton’s ‘Daniel’. Ouch. I prefer the earlier 60′s stuff, like ‘Right On’ that feature his immaculate guitar style without the clutter of noisy brass jazz, which I loathe.